GOAL: ZERO WASTE by 2020. UCLA Dining Services and Catering are working to reduce waste through a comprehensive, large scale composting and recycling program. UCLA Dining Services and UCLA Catering have a recycling program which not only reduces the amount of waste sent to landfill but also conserves natural resources, saves energy, and reduces pollution. 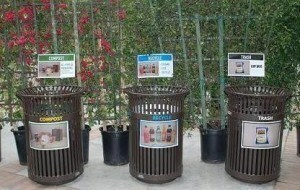 Each dining unit separates its trash into compost, recycling, and landfill waste. Catering separates all glass and plastic bottles and aluminum cans from its trash and puts them in a separate recycling bin for their trash company to pick up. At all four residential restaurants—De Neve Dining, Bruin Plate, Covel Commons, and FEAST at Rieber—food scraps from food preparation (e.g. egg shells, vegetable trimmings, etc.) 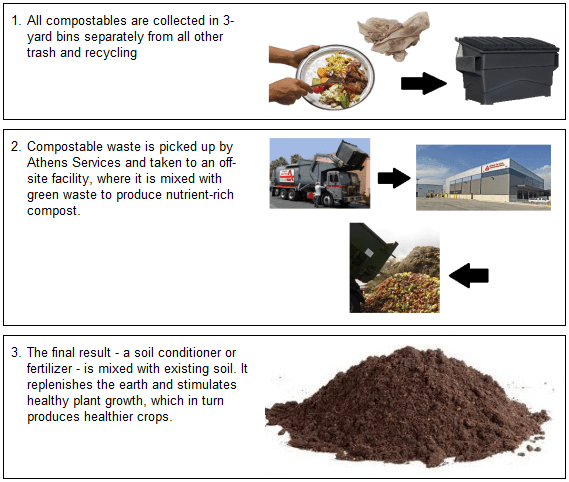 and the post-consumer waste (food left on plates) are separated from non-compostable waste and sent to a composting facility. Although this does not take the place of food waste reduction measures, this composting program significantly reduces the amount of waste we send to landfills. With the help of a pulper/extractor machine, all the post-consumer food waste and napkins are ground up. Water is used to clean off the plates and carry the food waste into the pulper/extractor. The pulper/extractor grinds the food up and extracts the water. The water is recycled back to carry more food into the extractor. The extracted food waste is put in a separate food waste dumpster and then picked up for composting. As with the four Residential Restaurants, pre- and post-consumer food waste is collected in all Quick-Service Restaurants: Bruin Cafe, Rendezvous, Cafe 1919, Bruin Plate Grab & Go Breakfast, De Neve Grab & Go, and De Neve Late Night. In addition to the kitchen food trimmings, the post-consumer food waste is diverted to the composting bin by guests. All dining materials are compostable, except chip bags and condiment packets. Campus wide, the UCLA Facilities Management Recycling Program recycles nearly 9 million pounds of materials generated annually by the entire UCLA community. 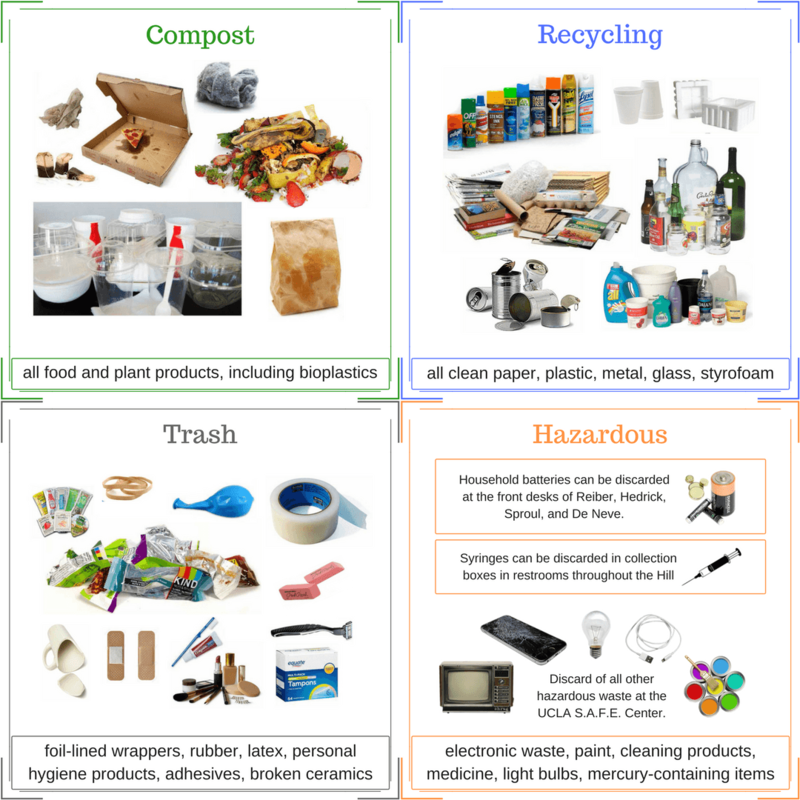 Learn more about the campus recycling program and get answers to your recycling questions.